You are brave and a great role model! Oh, and you are BEAUTIFUL! It was great to see you in person last night! I love this photo ... sad that people are ashamed of stretch marks, especially when thye are a result of a gorgeous baby! p.s. I just thought i'd let you know (if you didn't already) that I've added your blog link to my blogfeed of 365's http://arabbitaday.blogspot.com/p/other-365s-daily-blogfeed.html for everyone to see. Hope that's OK. Let me know if it isn't and i'll remove it! 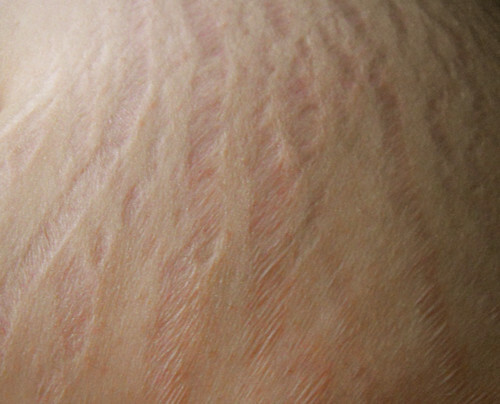 Back before I had stretch marks, I heard a woman refer to hers as "tiger stripes", marks of a "strong, wild woman." When I'm feeling down on myself about mine (oh, I miss having a smooth belly), I remind myself of the awesome work that skin did! Love this photo & quote. That is totally OK, Sarah, thank you!! Love this. Love you. You are awesome.